Precision Metal Craft LS intake manifolds are available for LS1, LS2, LS3 and LS7 engines as well as tall deck applications. Each PMC manifold is available in three different height configurations: short, medium and tall. Precision Metal Craft LS intake manifolds are manufactured in-house to PMC's exacting standards using the latest in CNC machining and fabricating equipment. Designed to increase airflow over the stock plastic unit, our manifolds allow you to take advantage of your engine's full potential. 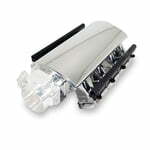 Made from 0.125-inch 6061 aluminum, PMC LS manifolds are designed to handle up to 30 psi of boost. Comes complete with gaskets, billet fuel rails and mounting hardware. Billet mounting flanges with o-ring grooves for the perfect seal. 1 piece tapperd runners with integrated velocity stacks. Bottom mounted fitting plate with one 1/4 npt and three 1/8 npt female fittings. GM style 92mm, 102mm or 105mm throttle body flange. Custom size throttle body flanges available on request. Available in 3 different height configurations: short, medium and tall. Includes -8AN black anodized billet fuel rails set up for stock or aftermarket injectors. Natural, Polished or Black Anodized finish. Not for use on pollution controlled vehicles. Seeing that you have a pretty low hood clearance, we would recommend going with the low profile version of the sheet metal intake manifold. It is not that much taller then a stock intake manifold. You will gain some HP with it but not very much if the engine is still stock. Probably somewhere around 10hp. Let us know if you have any more questions.